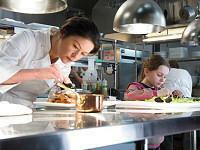 Overview - A perfectionist chef addicted to her work struggles to adjust when her sister passes away leaving her with a little girl to raise and a new soup-chef threatens to take over her kitchen with his high-spirited and free-wheeling ways. An undiscovered talent in the kitchen. A brash head chef who can't see past appearances to acknowledge a gifted new cook. A budding love affair developing amidst the creation of exciting new dishes. A tale of joy and heart ache that culminates in a climactic showdown of willpower and determination. Sigh... 'Ratatouille' is an amazing film. 'No Reservations' on the other hand, is a trite exercise in heartstring cliches and audience manipulation. Kate Armstrong (Catherine Zeta-Jones) is a tough-as-nails career chef who runs the kitchen at a high-brow restaurant in New York City. When she reveals a penchant for Gordon Ramsey-style tantrums after insulting several customers, her boss (Patricia Clarkson) orders her to seek psychiatric help. As Kate's life begins to unravel, her sister dies in a tragic accident and leaves her daughter Zoe (Abigail Breslin from 'Little Miss Sunshine') in the feisty chef's care. But wait... there's more! When Kate returns to work, she has to contend with a new sous chef named Nick (Aaron Eckhart) who grates away at her very last nerve. With every aspect of her life in limbo, Kate slowly but surely learns a thing or two about life, love, and happiness. 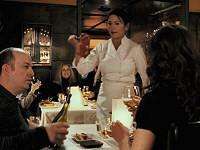 My major gripe with 'No Reservations' is that it suffers from identity crisis. The first act sets the stage for a dark drama involving an unlikable lead character struggling with the death of a sister, the responsibilities of caring for a child, and the total upheaval of her career. The second act takes a sharp left turn, suddenly becoming a comedy of errors as Kate fights against the inevitable changes in her life. Then the third act again jumps the genre ship, becoming a romantic comedy as Kate and Nick are suddenly attracted to each other for no apparent reason. I would have liked 'No Reservations' a lot more if it had picked a tone and stuck with it. I have to admit, I did enjoy the three separate acts, I just disliked how disjointed they were from each other. What could have been a uniquely dark drama, comedy, or romantic comedy, simply became an exercise in cinematic hopscotch. Making matters worse, the cast is underused and pigeonholed in predictable, unappealing roles. Zeta-Jones is limited by the intensity of her anger and the extreme nature of her character, while Eckhart's only purpose seems to be to snap Kate out of her fun. Breslin is also wasted in a part that charges her with the task of looking sad. The trio don't develop their relationships naturally, and awakenings in their personalities occur at random, rather than for logical reasons. In short, the characters are at the mercy of the story. The entire film feels scripted and predictable, lacking both the bounce of better romantic comedies and the edge of darker dramas. 'Ratatouille' may be an animated movie, but its filmmakers really understood the careful balance needed to pull off drastic tonal shifts while producing authentic character development. 'No Reservations' merely feels like a live action copycat, one that pulls disjointed elements from better films, crams them together, and prays that they stick. The filmmakers took an interesting risk, but the ends fail to justify the means. I know there's an audience out there who will enjoy this film despite its faults, but I thought it was an middle-of-the-road, melting-pot experiment that never managed to weave its individual pieces into a compelling whole. 'No Reservations' is presented with a soft-focus 1080p/VC-1 transfer that ultimately fails to distinguish itself from the standard DVD. Make no mistake, in a side-by-side comparison it's pretty easy to see the distinct resolution and stability upgrades inherent to the Blu-ray edition -- the high definition colors are more vibrant, details are crisper, and contrast is steadier. However, I was really surprised to see how many scenes didn't have the three dimensional pop I've come to expect from a new release. If I didn't know any better, I would think I was watching a ten-year-old catalog film. Fine details are hit-or-miss, long shots are often fuzzy, and on-screen text is sometimes as difficult to make out as it is on the standard DVD. Black levels are also inconsistent -- sometimes dipping low and producing gorgeous shadows, while at other times barely dropping below charcoal gray. As it stands, the biggest upgrade on display centers around the condition of the source. The Blu-ray version doesn't suffer from the artifacting and source noise that appear from time to time on the DVD. Devotees of 'No Reservations' will certainly want to pick up the Blu-ray edition as it has the edge, but casual fans should hold their wallets and wait to nab this one during an Amazon BOGO sale. A romantic comedy isn't the sort of film I usually throw in my Blu-ray player to wow friends, and 'No Reservations' doesn't change that. The disc's simple Dolby Digital 5.1 surround track (640 kbps) should register as a disappointment, but this little-mix-that-could is more than capable of handling such an insignificant soundscape. While dialogue may be clear and nicely prioritized, the remainder of the soundfield is practically trapped in a vacuum. The rear channels are particularly silent, and the front channels rarely engage the listener -- for a busy kitchen, the soundfield lacks proper acoustics and background details. To top it all off, dynamics are decent, but uninspiring LFE support makes the entire track fall flat. 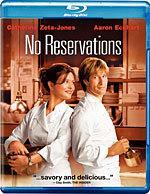 The Blu-ray edition of 'No Reservations' includes the lone supplement that appears on the standard DVD -- an episode of a 23-minute Food Network show called "Unwrapped," hosted by Marc Summers, in which Zeta-Jones, Eckhart, and the real chefs who were consulted by the filmmakers, generally blather on about nothing of significant interest. My wife and I are hopelessly addicted to cooking shows, but this one gets a big "meh" from me. 'No Reservations' has more to offer than a typical romantic comedy, but it still falls short of its potential, ultimately drowning in a debilitating identity crisis. The Blu-ray disc doesn't help matters, as it features a soft transfer, an underwhelming audio track, and an anemic pair of supplemental TV episodes. While I think the movie itself is decent enough to warrant a look for genre fans, the average BD production values should convince you that a rental is a safer bet.